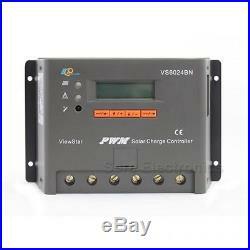 ViewStar VS6024BN 60A PWM Solar Charge Controller Electronic Protection -25+55. 32 bit MCU with high speed. High efficient Series PWM charging. Four battery type options: Sealed, Gel, Flooded, and USER. Intelligent lighting and timer control for solar lighting system. 12 bit A/D high-precision sampling to ensure accuracy. Use MOSFET as electronic switch. Full control parameters setting and modification, diversified load control mode. Adopt graphics dot-matrix LCD screen and HMI (human-machine interface) with 4 buttons, integrated menu displaying and operation. RS485 ports with MODBUS communication protocol. Optional PC monitoring software and remote meter for real-time monitoring and battery management parameter setting. Battery reverse polarity protection. Sealed: 14.6V, Flooded: 14.8V, User-defined: 917V. 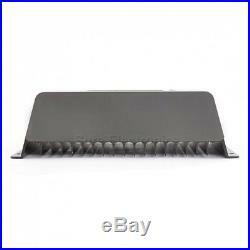 Gel: 14.2V, Sealed: 14.4V, Flooded: 14.6V, User-defined: 917V. Gel /Sealed /Flooded: 13.8V, User-defined: 917V. Low voltage reconnect voltage. Gel /Sealed /Flooded: 12.6V, User-defined: 917V. Low voltage disconnect voltage. Gel /Sealed /Flooded: 11.1V, User-defined: 917V. 15mA(12V); 10mA(24V); 9mA(36V); 8mA(48V). 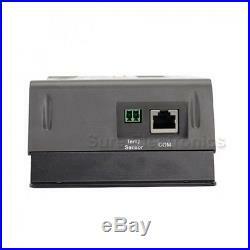 RS485 / RJ45 interface. For Manual, Driver and Tutorial. 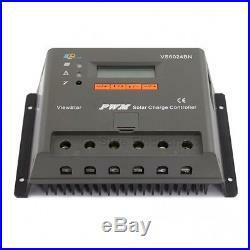 ViewStar VS6024BN 60A PWM Solar Charge Controller x 1. English Manual x 1. The item “60A ViewStar VS6024BN 12V 24V Auto EP PWM Solar Charge Controller LCD Display” is in sale since Friday, December 8, 2017. This item is in the category “Home & Garden\Yard, Garden & Outdoor Living\Pools & Spas\Pool Equipment & Parts\Pool Heaters & Solar Panels”. 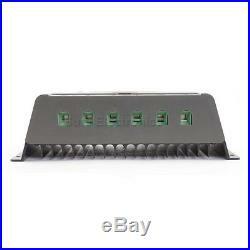 The seller is “sureelectronics” and is located in shenzhen. This item can be shipped worldwide.